In stock -This product will ship today if ordered within the next 7 hours and 9 minutes. 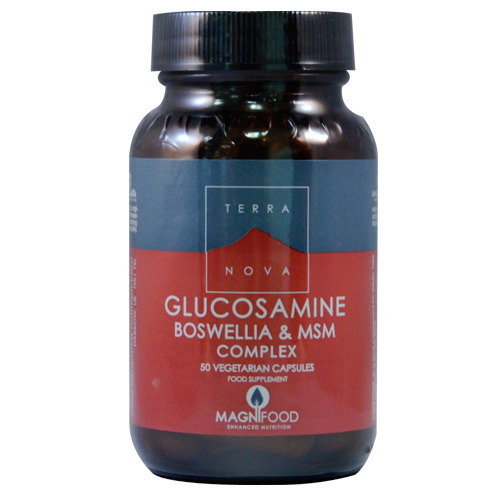 TERRANOVA Glucosamine Boswellia & MSM Complex is a scientifically-based formulation of nutrients for joint support enhanced with highly active, whole and unadulterated superfoods and botanicals. Research suggests that compounds found in boswellia resin may help the body to maintaining healthy inflammatory and circulatory responses in joint tissue. In addition to possessing constituents which may help support inflammatory response, nettles are also rich in several nutrients that are required for the maintenance of joint health. Some (such as boron,silicon, calcium, vitamin C and vitamin K) are involved more in the structural integrity, while other nutrients in nettle (including selenium and vitamin E) provide antioxidant defense against free radicals which can otherwise adversely impact on joint health. Ginger may help support inflammatory, pain and circulatory response - all of which are pertinent to joint health. Celery is not only abundant in free radical scavenging antioxidants, but also is a very good source of nutrients involved in maintaining the structural integrity of joint tissue (such as manganese, molybdenbum, vitamin C and vitamin K.
Research indicates that antioxidant status is one of the most important factors in determining joint health. SRB contains more than 100 known antioxidants including tocotrienols, tocopherols, alpha lipoic acid (which also recycles antioxidants such as vitamins C and E), coenzyme Q10 (CoQ10) and numerous carotenoids. It also is shown to possess activity of the antioxidant enzymes superoxide dismutase (SOD) and catalase. Below are reviews of TERRANOVA Glucosamine Boswellia & MSM - 100 Vegicaps by bodykind customers. If you have tried this product we'd love to hear what you think so please leave a review. Helps my body work and feel flexible. Joints feel fluid. My joints do feel better since taking this, for example my neck isn't stiff when I turn fully each way. I have been vegan for about 18 months but have recently started eating whole foods only, with no added oil in my food. I have to say the difference is amazing, I feel great and recovery time from exercise/training seems to be quicker too! I also take the B12 from Terra nova. I just feel better being on this. It's the Boswellia that I welcome. Trustworthy brand. Great service from bodykind! I know it is doing me good! Great value larger jar. I use this for a few days but I think that I feel less pain to my body.